Allied Wallet has created several fully customisable international payment solutions for businesses of varying scales. The majority of your customers will opt to make payment with their credit cards while some may prefer to use one of the many alternative payment options we support. Regardless of how they choose to pay, we have the right solution for you so that you can accept payments online. Designed for small and mid-sized businesses looking for a nimble, cost-effective, and simple solution to accept online payments. Hosted by Allied WalletAllied Wallet’s hosted payment page allows you to capture transaction information easily and securely with all of Allied Wallet's signature security features. 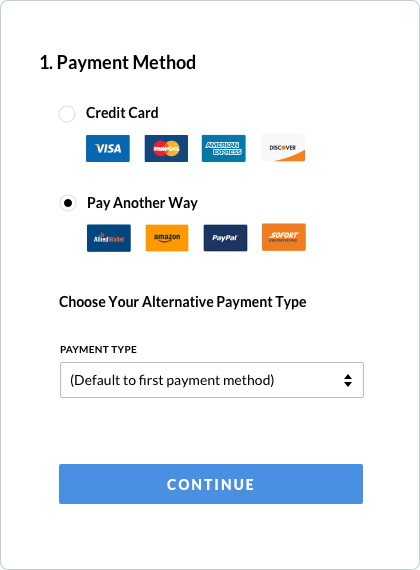 Never Miss a PaymentAccept any major credit card and a variety of different preferred payment methods from countries all over the world with one simple integration. Extensive PluginsQuickPay seamlessly integrates into a variety of order management and shopping cart solutions to provide you with a full-featured e-commerce experience. A powerful option for larger businesses – this method provides complete customisation and control over the checkout experience, offering your business more scalability. Captivating DesignExtensive branding and design options to ensure that you are in charge of your own brand and checkout experience at all times. Complete ControlOur Direct Integration enables you to capture payment details on your own secure server and send the transaction data to Allied Wallet for processing. As the most versatile payment processor in the industry, Allied Wallet’s payment processing allows you to expand your business without limiting the ways your customers can pay. In addition to helping our customers accept payments online, we can also help to accept European Direct Debit and ACH payments for added flexibility. Located in the United States with a support team from all over the globe, Allied Wallet’s dedicated integration team has provided stellar support for over 100,000 new and existing merchants to accept online payments. We’ll make sure to help guide you through the process at every step so that you can focus on your business. Allied Wallet provides innovative security with PCI-compliant and SHA-256 SSL encryption at no extra charge or monthly fee. In addition to security, we offer chargeback support for customers and user testing on your site. With our low rates starting at 1%, you’re certain to maximize your profits.